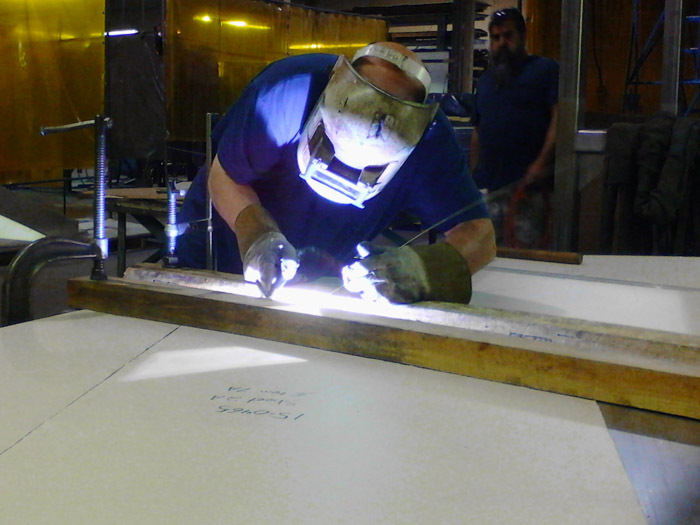 When it comes to custom fabricating stainless steel and other metals and materials, for over seventy years and four generations, we’ve been exceeding the expectations of our Food, Pharmaceutical, Process, and General Industrial customers. shouldn't we be exceeding yours, too? We have yet to find another fabricator that can even come close to the superior workmanship provided to us by HRH, and our partnership of over two decades has been a driving force in the success of our company. Harold Jr. is retired now, but still bothers his sons about the company and how it needs to keep growing. Tom is now the company president, Mike is in charge of purchasing, and Ryan is a shop manager. Together, they’re still pushing the company to grow and be the best metal fabrication company around. But don’t take our word for it. Read what our customers have to say. Or better yet, give us a call, request more info, or come visit our facility to discuss how HRH Inc. can make a big difference in your next job! 1942 – Harold R. Henrich Sr. starts small sheet metal shop in Hackensack, NJ. 1956 – After serving his country in the US Navy, Harold Jr. joins his father’s company and pushes for growth. 1968 – Harold Sr. and Jr. move the company into 10,000 sq. ft. building in Carlstadt, NJ. 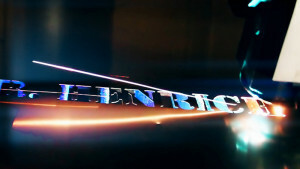 1975 – Harold Jr’s son, Tom, joins HRH and becomes the third generation Henrich working in the company! With new equipment including a Strippit 1250/45 Turret Punch Press and a Cincinnati Press Brake, the company grows into a real custom metal fabrication facility. 1978 – Moving to a 30,000 sq. ft. facility in Saddle Brook, NJ, we increased welding capacity from 3 to 8 complete welding booths; rolling capacity with a new Montgomery 8ft. 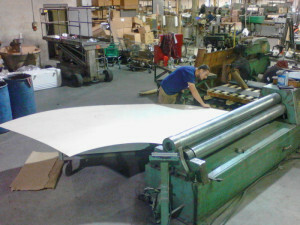 Pyramid Bending Roller; and bending capacity with another new Cincinnati Press Brake. We also purchased the second laser/punch combo machine built by Strippit, making us true pioneers having the only laser equipped metal fabrication shop in New Jersey! 1979 – Harold Jr’s younger son, Mike, joins the company. 1982 – Harold Jr’s daughter, Donna, joins the company. 1988 – We outgrew the Saddle Brook location and moved to our current 40,000 sq. ft. facility in Lakewood, NJ. We replaced our old 500 watt laser with a new state-of-the-art Strippit Combo 1,700 watt, 41 station turret combo machine; and increased our welding force to 10 welders, each with a complete welding station. 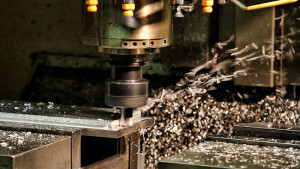 Also, all machining moves in-house with the purchase of two new Fadal VMCs, bridge ports and various manual lathes. Tom’s son, Ryan, joins the company as the fourth generation Henrich working in the company. 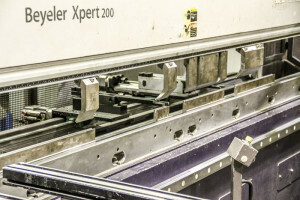 To better keep up with the new laser we purchase a new state-of-the-art Bystronics EXPERT Press Brake. Always moving forward, we add two new welding machines, a Lincoln FLEXTECH 450 and a Lincoln POWER WAVE C300. Over the years, we’ve grown our most valuable resource – a loyal workforce that is second to none – with many of our team being with us for 5, 10, 15, 20 – even 30 to 40 years – demonstrating the continuing dedication of our staff and the Henrich family. From the moment you award us your job to the moment it ships, we’re paying attention. To your job. Because quality is no afterthought here. It’s baked-in to everything we do. 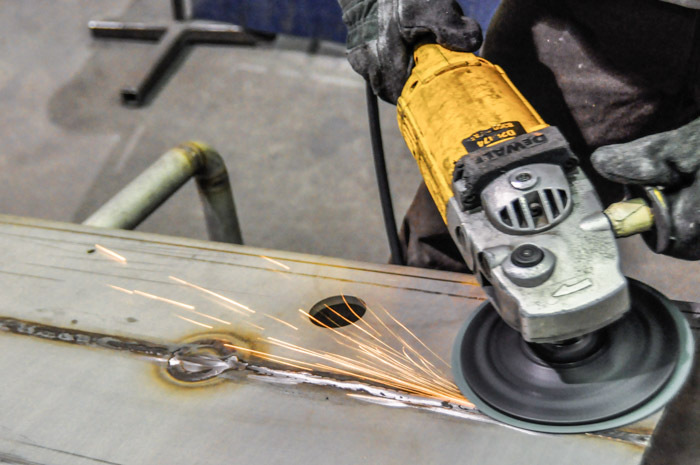 From design and engineering, through manufacturing, finishing and assembly, our loyal and experienced team of master craftsmen and personnel working with our state of the art facilities gets your custom fabrication and welding job done – and with no nasty surprises. With the purchase of a STRIPPIT laser punch machine in 1978, we became the first fabrication shop to perform laser cutting on the East Coast. Because we know laser cutting – thin to thick and one piece to thousands – we can supply you with quality laser parts at a good price. To better serve our customers, we started doing our own machining in 1986. We not only do machining to compliment our fabrication ability but with our 2 FADAL VMCs, we are able to offer our customers production machining at a very good price. We continually invest in the latest technology, not just to produce better quality parts faster, but to also attract a younger work force. But we never forget there’s always a need for the old school press brake for those non-conventional projects. Various press brakes from 6ft. to 8ft. From 20 gauge to ¼ inch thick, we’re skilled in the production of cylinders, cones, and essentric cones. Our experienced fabricators look forward to meeting whatever challenges you can throw at us. 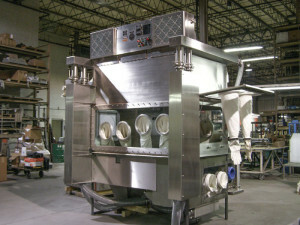 The last step to great quality fabrication is grinding and polishing. 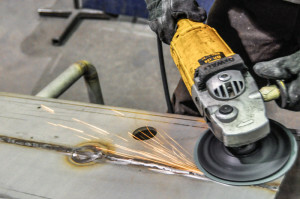 From rough grinding on steel frames to RA(u-in 8) on stainless steel hoppers, we excel at the jobs other shops are afraid of. 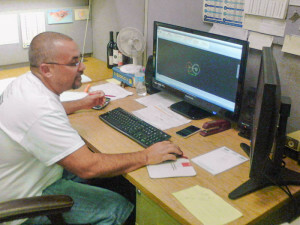 Not only can we make your parts, we can assemble them for you as well. With 20’ ceilings and 17’ clearance under our 5-ton crane, we can assemble just about anything your project needs. 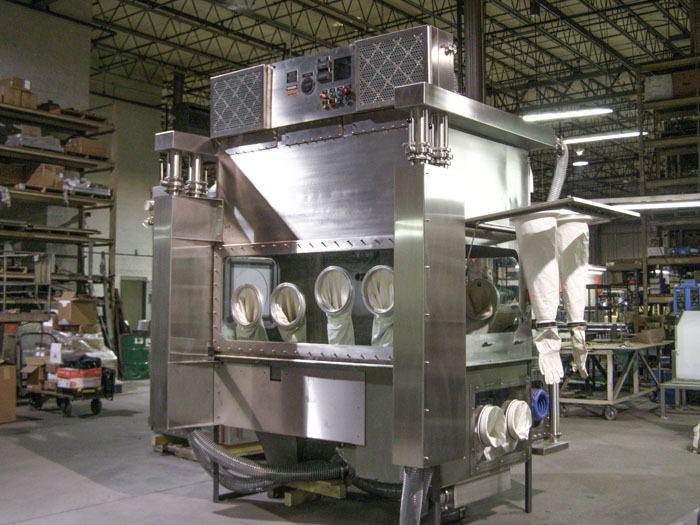 So, from a simple machine guard or mounting bracket to the full manufacturing and assembly of a 12’x8’x14′ glove box isolator, we get it done for our customers – everyday. So call, fill in our Request Info form, or come on in to see us and let’s talk about how we can do it for you. Coperion K-Tron has utilized Harold R Henrich for 35 years as a supplier of fabricated metal components. We have come to expect no less than the highest level of quality and craftsmanship from them. This is extremely important to our business given the volume of equipment we produce for the food and pharmaceutical industries with their associated demanding requirements for fit and finish.